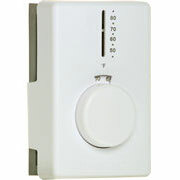 For accurate and simple climate control at home, use this affordable Honeywell CT60A manual thermostat for adjusting your electric baseboard heat. 2 or more: $32.00 ea. If you value accuracy and simplicity in your home’s heating and cooling systems, you’ll love this Honeywell CT60A electric baseboard heat manual thermostat from Today's Concept. The Honeywell CT60A model is the perfect fit for 120, 240, and 277 Vac control in electric heating systems. You'll be amazed at the Honeywell electric heat thermostat's manual, simple and effective operation that offers optimum performance day after day.